Dr Barua Graduated with Honours from a prestigious University in Mumbai in 2005. After working in a Private Practice for 2 years, he decided to take up further studies in Australia and understand more about all the dental materials used in Dentistry. 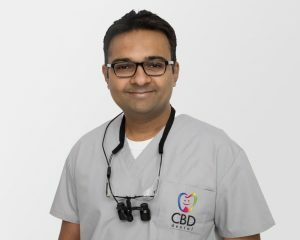 With a keen interest in Technical side of Dentistry Dr Barua completed his Diploma in Dental Technology from Sydney Institute in 2009 while continuing to work part time in a Dental Lab in Sydney. With all the Technical knowledge he decided to apply it in his Clinical work and completed his Australian Dental Council Exam in 2010. Since then Dr Barua has worked Full time in Private practice in the Illawarra improving Oral Health of all his patients. He is always in pursuit of providing best possible care for his patients and keeps updated about the latest development in dentistry with continuing professional development courses. With General Dentistry, Implant and Cosmetic Dentistry, Preventative and Interceptive Orthodontics, Kids Dentistry and Dentures being his forte Dr Rj has also completed a course on Managing Snoring and Sleep Apnoea in 2016 to treat the disease which is slowly rising with the rise in obesity in general population. Besides Dentistry, Dr Barua loves music, travel, good food and Bollywood. Dr Barua is also a patron of many charities and a Philanthropist by nature.